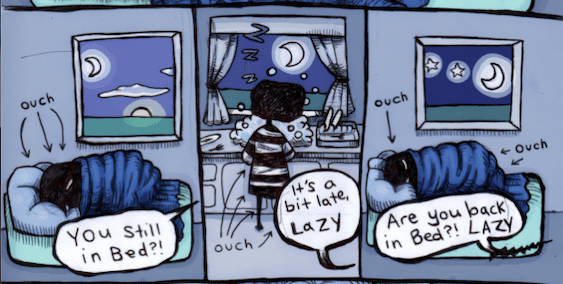 Vonne created this comic for Spooniehacker about growing up with undiagnosed hypermobility. She also answered a few questions for us about her art. Q: What inspired this comic? Q: Have you found creating art has helped you deal with your health conditions? A: Yes, drawing is very meditative and puts you into a state of relaxation and sorting your mind out by just letting the picture happen. It also helps studying anatomy and science, simply as means of improvement. Q: What’s your background as an artist? A: I’ve been drawing from since I could pick up a pen. I’ve improved somewhat at college/uni for art, multimedia, etc. but no one in particular taught me how to draw. Q: What are your goals and inspirations as an artist? A: I’ve made a lot of plans that have failed or I wasn’t meant for, so now I’m honestly just going wherever the wind blows, it has seemed to work out pretty well so far. I don’t have any particular inspirations, I just get it when I can.